Dining Services operates an in-house bakery, “Not Just Desserts,” that supplies freshly baked breads, pastries and desserts to all areas of our operation. We are extremely excited about the opening of our brand new gluten free bakery on campus which will not only supply baked goods to our dining operations but will also be made available to purchase by the UConn community. 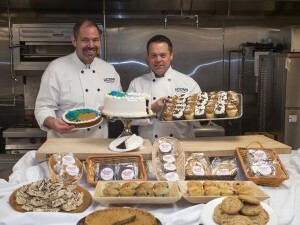 Dining Services at the University of Connecticut opened the kitchen of the first ever gluten-free bakery on a college/university campus this month with the goal of eventually supplying all residential dining units, cafes, catering and grab and go’s with gluten-free baked products by the end of the semester. Want to order a birthday cake for your roommate? A 10″ chocolate cookie for a friend? A fruit basket for your co-worker? Simply call (860) 486-3128 to place your order. 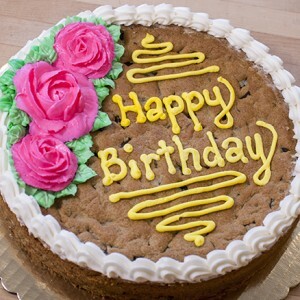 Not Just Desserts Bakery offers the option to purchase custom birthday cakes and ten-inch chocolate chip cookies. They can be decorated with a message of your choice and delivered to one of the residential dining unit for pick-up. You may pay for your order with cash, check or Husky Bucks. All orders may be picked up at the Union Central Exchange C-Store in the Student Union. Carrot cakes come with white cream cheese icing. All cakes and cookies are custom-decorated to your specifications. Products made at the UConn Bakery are made in an environment where nuts are used and handled. For that reason we cannot guarantee any products made at the UConn Bakery are nut free. Even if nuts are not on the list of ingredients there still may be a trace of nuts or nut oils in the product. If anyone is allergic to any type of nuts it would be advised to not eat any of the products from the UConn Bakery. This includes the Not Just Desserts line.